Classic-Castle.com • View topic - LotR sets revealed! Edit by Bruce: I wanted to start a new thread with the Toy Fair pics so people wouldn't have to dig 15 pages into the other LotR thread. Some people had already begun discussing the new pics, so I split those off to be part of this thread. Scroll down about five posts to see images of the new sets. Back to Kev's original post. I agree with Kev, Star Wars is way, way more popular with kids. LotR is more a teen/adult thing. Of course, there are exceptions, perhaps more here than in general - we are on a Castle forum after all, not a SW/sci-fi one. Thanks for the pictures, Kev. The horse doesn't look as silly as I thought it would. It does have a more realistically shaped head compared to the current horeses, but it looks like it'll blend in fine. The sets look pretty decent too. If only I had some money; it's a terrible time to be a broke TFOL! Ooh! Just noticed the sand green in Helms Deep! Awesome! Kev wrote: You are the exception, and, of course, there are exceptions. I've been an elementary school teacher since the mid 90s, and the children that like either the LOTR movies or books are few and far between, even during the peak of the movie popularity. The most I could ever get out of the kids when mentioning LOTR is "my dad likes those movies." Star Wars has been a constant currency of playground activity and classroom chatter ever since the rerelease of the OT, through the prequels, and especially now with the TV show. Out of the 800 kids at my school, I can name maybe three that are fans of LOTR. None of them were interested in the idea of LOTR legos when I mentioned the new sets to them. They all said they had outgrown them. Hopefully, the Hobbit will change this. LOTR is a teen/adult property. Kids fantasy is dominated by HP and the Rick Riordan stuff. I've not known one kid that managed to finish one of the books, let alone the whole series, though a couple try every year. I think once the core sets are done for the Hobbit this fall, the best bet for Lego would be to get out some UCS stuff, like Saruman's tower. I don't know, all my friends felt more or less the same way, and we didn't have much anything else in common (and no, we didn't meet in some LOTR fan club or something). I do seriously doubt that the lineup will seriously compare with the SW sets in terms of profit, but I'd be surprized if it doesn't surpass Harry Potter and dwarf POTC. Also thanks for the pics. I'm quite excited to use the new horse, I just hope that it doesn't look silly next to my existing ones. 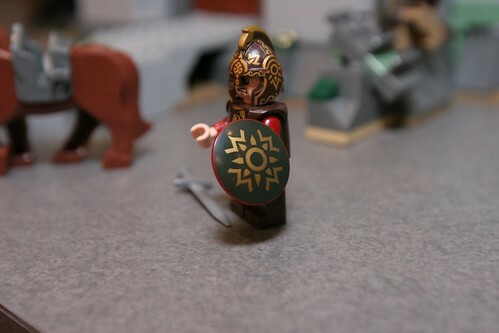 The sets look full of useful parts, the figs look cool (albeit fleshy), and the weapons, helmets and accessories are top knotch (accepting the trajic fate of Gandelf's staff). Romans 8:37~ Yet in all these things we are more than conquerors through Him who loved us. I figured I'd start a new thread, rather than have people digging 15 pages in to the old thread to find these. 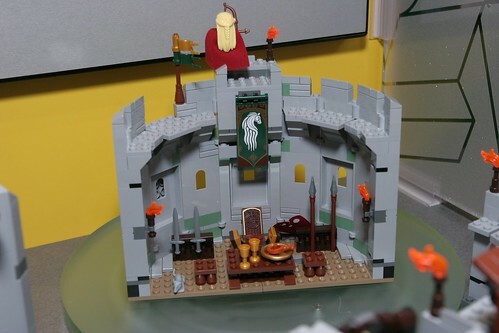 Images have now come out from Toy Fair of the Tolkien sets. Gandalf Arrives: Frodo and Gandalf, new horse, small cart. The ruins open up to show the interior - I didn't know it had this feature. Also, you can see the new Nazgul cape well here. Here's a close up of the horse rearing. Mines of Moria: Pippin, Gimli, Legolas, Boromir, a cave troll and two Moria orcs. Here's a good pic of the troll, plus you can see that Legolas has a new hairpiece (not the collectible fig version). The Orc Forge: 5 orcs. Army builder. Meh construction, IMO. Check out the detailed wall construction! 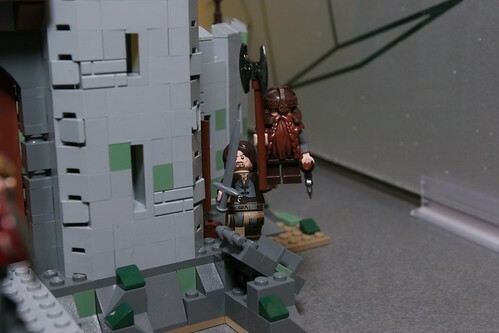 Shelob Attacks: 3 minifigs: Frodo, Samwise and Gollum. Awesome spider design. Just look at the printing on this guy in the Helm's Deep set. I think it is one of the best figures lego has ever released. There is actually another variation of the fig with different helmet printing here. 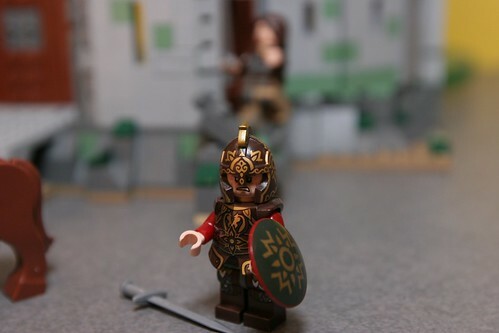 Yes... King Theoden may be one of the best minifigs ever created by TLG. I just love that they got the horse on the ridge of the helmet perfect. Eomer is the other fig with the gold printing on the silver/grey helm. Instead of making a new mold for the helm of Theoden, Eomer, and a common rohan soldier they used different colors for the helmet and different printing. All different and yet cohesive as a faction. Genious strategy as the mold is the most expensive part. I am really blown away with all of these sets. The minifigs are beyond incredible and I really like the builds as well. I truly feel these sets pay homage to the castle fans here at CC. In no other theme have I seen so much detail (and bricks) put into the terrain. And on no other forum has terrain been better built than here when people MOC with their castles. Their are so many brick bricks in light bley it makes me drool. The detailed interior of helms deep is inspiring. So many weapons. It looks like we will be getting tons of the new CMF highlander longswords and the CMF spears. The banner is awesome as well. Sorry for the double post. Are these new 1x thickness (or width) panels for making arrow loops with? If so that is a brilliant solution without all of the extra brick. Also adds an element that goes well with the other panels thus allowing odd stud number construction with panels. DaleDVM wrote: Sorry for the double post. Are these new 1x thickness (or width) panels for making arrow loops with? I don't think the panels are new, it's just the regular panels we've seen in the passed used as windows in CITY and the like used for arrowslits. I agree 100%. The use of the panels in such a genius way is something I know I would never have thought of, I'm glad LEGO used it so well. Now that I look closer it appears to be these two pieces. Not sure if what you are saying about these used as windows in city sets is right or not. I rarely if ever buy city stuff. Unfortunate, being 2 studs wide they will stick out on the inside with a 1 stud thick wall. The curved walls will look aweful from the inside if it is built that way. I was worried that an updated horse would make the old one look dated and obsolete. But I think they've mananged to do a subtle update to the head shape (and obviously add the rearing legs) so as it shouldn't look to odd next to the 'old style' horses. So I'm in agreement, I like it. A lot more versatile and less 'duplo-y' than the cows. But will current barding and head armour fit?! (Barding would obviously prevent the hinged action but the over all shape looks fairly similar.